BANGI 10 OGOS 2010 – Malaysia with its vast biodiversity resources has an immense potential for research that can be economically beneficial to the people, said newly conferred Prof Emeritus Dr. Nor Muhammad Mahadi. 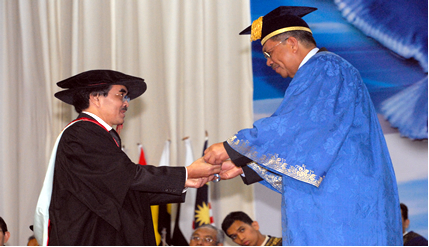 Speaking when accepting the title at the seventh session of the 38th Convocation of Universiti Kebangsaan Malaysia (UKM) here today he said that the research area is vast and could bring great opportunities that transcends geographical borders. Speaking on the last day of the ceremony to graduads he said “the biotechnology research world is so wide for you to explore. Urging them to grab the opportunities he asked them to use the chance because the playing ground is not limited by national boundaries as the world is their playground. He said that biotechnology is an area which needed various expertise to make it successful giving the genome based research which needed graduates from all the various science disciplines as an example. “What is needed is the determination and openness to foster collaboration and synergy which is needed in these multi disciplinary field” said Prof Emeritus Nor Muhammad who is the Director General of Genome Institute Malaysia. Nor Muhammad who retired from UKM three years ago advised the graduates to explore opportunities offered in the field of biotechnology which has immense benefit both economically as well as in terms of discovery. “The result of the various biological research with the mathematical biology platform will change the equation where two plus two is no longer four” . As a country with mega biodiversity Malaysia has the biological sources that is wide that can benefit the country economically and in terms of knowledge, he said. Prof Emeritus Nor Muhammad received his Bachelors Degree in Microbiology from Monash University in 1974 received his Doctorate from the same University in 1978. 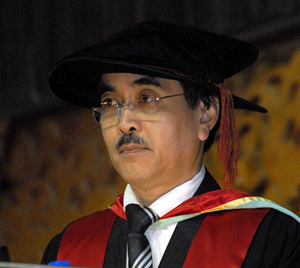 He started his career in UKM in 1973 as a tutor in the Faculty of Science. He was appointed a lecturer in the Microbiology unit in 1978 and made an Associate Professor in 1988 then Professor in 1994. Internationally he was responsible to coordinate Malaysia’s involvement in International Asia Pacific in health which was headed by Fred Hutchinson Cancer Research Centre, Seattle, America since September 2004. He also heads the Malaysia-Stanford University International Research Project while being the source of reference and guidance in the field of biotechnology and also the backbone in planning and outlining the establishment of the Biology System Institute (INBIOSIS). INBIOSIS was designed to provide a dynamic infrastructure and environment for multi-disciplinary researchers in pursuing challenging fundamental research on tropical biology resources. A total of1865 students from the Faculty of Science and Technology (FST), Faculty of Social Sciences and Humanities (FSSK), Faculty of Economy and Business (FEP), Faculty of Education (FPEND), Faculty Allied Health Sciences (FSKB) and the Faculty of Islamic Studies (FPI) receive their Diplomas, Advance Diplomas, Graduate Diplomas, Bachelors and Masters Degrees in today’s ceremony.